Available straight away, the C224e, C284e and C364e are updated versions of the C224, C284 and C364 launched in 2012. This new generation is based on the same print engine as before, running from 22 to 36 ppm in monochrome or color, and has the same finishing options and originals-handling features. The "sliding" action on the touch-screen interface resembles smartphone and tablet use. "Panel Customization 2.0" is intended to increase the degree to which the interface can be set up specifically to help users find their way round features they use often. Apart from the interface rethink, the new C224e, C284e and 365e MFPs have a new option to scan to the whole gamut of MS.Office formats (Word, Excel and PowerPoint). Up to now it was only possible to scan to PowerPoint on a Konica Minolta device. 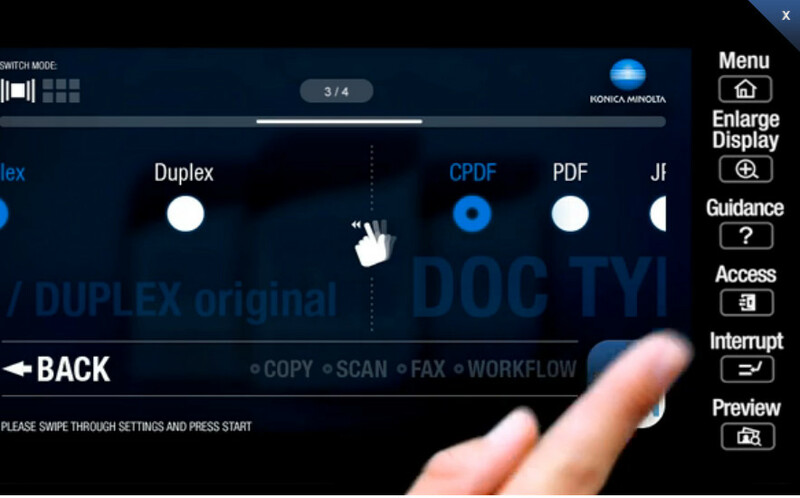 The brand joins Canon with a scan-to-Word feature, and is the first to have a built-in scan-to-Excel feature, without any external software. This new function improves the integration of documents and information from external sources into the company environment. All the information in these new machines will be on Your DMO very shortly.